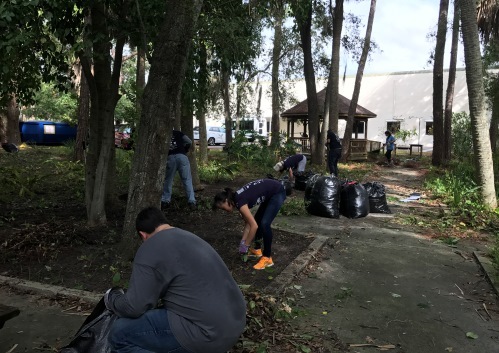 Synergy’s CSR Snapshot features some of the most recent corporate social responsibility activities that Syniverse has participated in to help make a positive impact on the communities where we live and work. 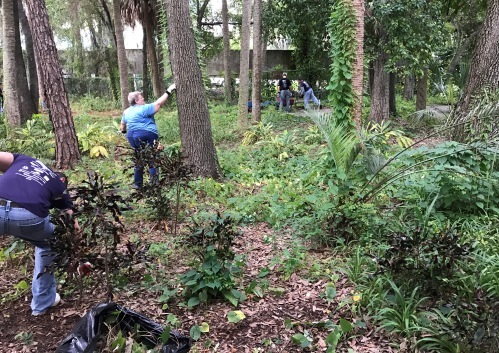 On Oct. 6, a team of employees from Syniverse’s headquarters office in Tampa, Florida, contributed a day of landscape refurbishment and yard work to the MacDonald Training Center, in Tampa. 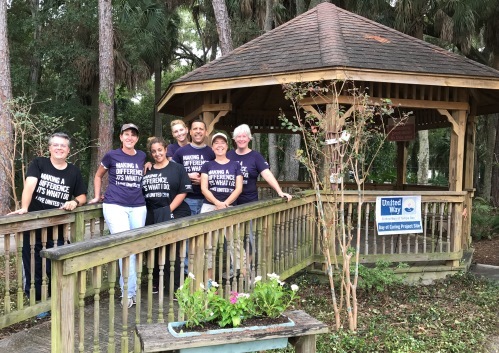 Our activity was part of the United Way’s “Day of Caring,” an annual event by the United Way Suncoast chapter in Florida that recruits volunteer teams from companies and organizations across three counties to help local charities for a day. This year, approximately 2,100 volunteers from more than 65 local companies were mobilized to tackle some 150 projects at local charities. Syniverse was honored to be one of those volunteering companies. It’s the eighth year we have participated in the Day of Caring. Our team, with me in the middle row, in the center, holding red gloves, and my co-leader, Liz Pippin, kneeling directly in front of me. Clearing some overgrowth in the nature-walk area. What organization did the activity support? The MacDonald Training Center, an organization that helps people with disabilities learn and improve various skills. Its services range from vocational skills training and life-enrichment activities, to computer lab and fine arts instruction, to employment counseling and placement services for people who have a variety of disabilities. We originally became interested in this activity because it required a team large enough to accommodate our big team and because it required a day-long commitment, which was one of our goals. However, once we had a chance to tour the Center and learn more, we became impressed with its mission and operations, and we became even more interested in helping it. We also wanted to select a charity that Syniverse was not already helping. How many Syniverse employees participated? Our team included 15 team members and was led by me and Liz Pippin, Advisory System Engineer, Quality Assurance. A few members of the Center’s leadership team and maintenance team also lent a hand and worked with us during different parts of the day. What did the Syniverse team do? 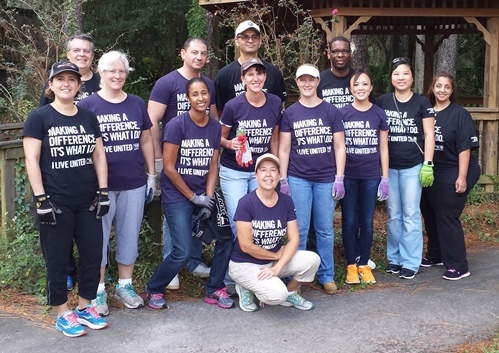 Our team worked from about 8:30 a.m. to 4:00 p.m. and helped the Center refurbish up its nature-walk area. This area only gets maintenance about once a year, so there was extensive plant overgrowth in the landscaping that needed to be trimmed and cleaned up. We raked, removed vines, trimmed bushes and packaged a lot of yard debris. We also donated two picnic tables to the Center’s pavilion area, one to replace an old table and another to increase the total seating, and we stained the new tables, too. Cleaning up around the central path. Our finished work left a much neater nature walk, with vines removed from around the trees, new flowers planted throughout the area, and two new picnic tables. What was the single most rewarding part of this project for you? Actually, it was the part before the project, when we met the leadership staff and got a tour of the Center. This allowed me to see how much the employees of this organization have their heart in their job and how much they totally support the Center’s mission: “Empower people with disabilities to lead the lives they choose.” They shared stories of people who want to be just like fully abled people, and how these people learned the training they needed to be able to live independently. I was moved to hear the stories and see how happy their clients were. My co-leader for our project, Liz Pippin, also cites this part of our experience as being the most rewarding to her. She said the tour allowed her to learn the important history of how the program started and how much they do every day now to improve the lives of people. And, like me, she said she would also like to help out at the Center again in the future. I hope we do. Ellen King is IT Asset Management Analyst and works at Syniverse's headquarters office in Tampa, Florida. Great Job everyone! They provide job training for disabled adults.